In September 2015, Madrid —the capital of Spain— initiated a participatory democracy project, Decide Madrid (Madrid decides), to enable participatory strategic planning for the municipality. 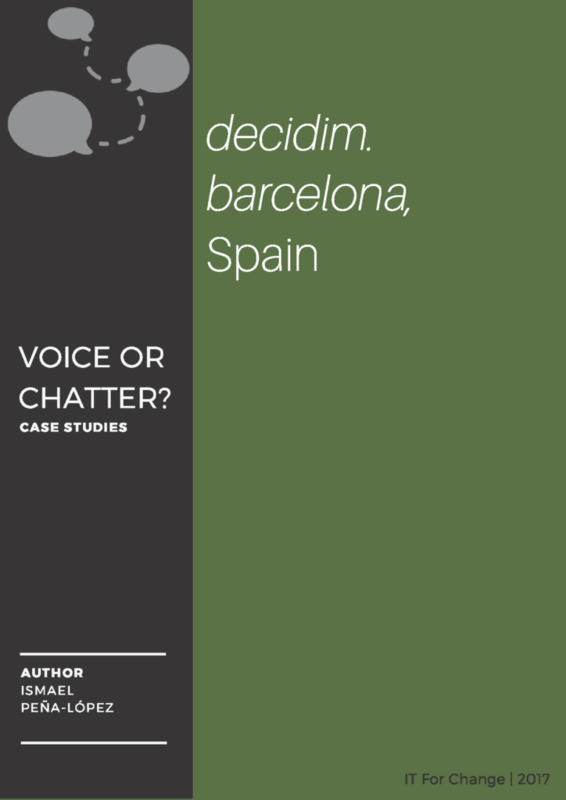 Six month after, Barcelona â€“ the second largest city in Spain and capital of Catalonia â€“ began its own participatory democracy project, decidim.barcelona (Barcelona we decide) in February 2016. Both cities use the same free software platform as a base, and are guided by the same political vision. The success of these initiatives and the strong political vision behind them have spawned plenty of other initiatives in the country â€“ especially in Catalonia â€“ that are working to emulate the two big cities. These cities are sharing free-software-based technology, procedures and protocols, their reflections â€“ both on open events and formal official meetings. What began as a seemingly one-time project has grown in scale. What remains to be analyzed is the strength and stability of the new relationships of power and how exactly these will challenge the preceding systemic structures and lead to newer ones. The culture of participation was hitherto scarce and mainly dealt with managing the support of citizens in top-down type initiatives. Changing the mindset implied turning many of the departments and processes of the City Council upside down â€“ a need for new coordination structures, a new balance between the central administration and the districts, a speeding up of the slow tempos of the administration, and new ways to manage public-private partnerships. Using Anthony Giddensâ€™ Structuration theory, this case study examines the e-participation initiative of the City Council of Barcelona (Spain), decidim.barcelona. The study analyzes the inception and first use of decidim.barcelona for the strategic plan of the municipality in the years 2016-2019. This case study is divided into three main sections. First, we examine the institutionalization of the ethos of the 15M Spanish Indignados movement, the context building up to the decidim.barcelona initiative. In the next section the methodology, the case, its design and philosophy are discussed in greater detail. Anthony Giddensâ€™ Structuration theory and Bruno Latourâ€™s Actor-Network theory are unpacked here. In the final section, the results of the project are analyzed and the shifts of the initiative in meaning, norms and power, both from the government and the citizen end are discussed. PeÃ±a-LÃ³pez, I. (2017). decidim.barcelona, Spain. Voice or chatter? Case studies. Bengaluru: IT for Change. PeÃ±a-LÃ³pez, I. (2017). Sovereignty in the digital age. Keynote speech at the All Digital Summit, Barcelona 4-5 October 2017. Barcelona: All Digital. PeÃ±a-LÃ³pez, I. (2017). decidim.barcelona. from e-participation to the devolution of sovereignty. “ICT-mediated citizen engagement: Voice or Chatter?” webinar 5 July 2017. Bengaluru: IT for Change. PeÃ±a-LÃ³pez, I. (2017). Voice or chatter? Transforming democracy in technopolitical institutions. Civic Tech: creating and enabling networks for a liquid democracy. Maker Faire. 18 June de 2017 Barcelona: Caixa FÃ²rum. Barcelona: Ateneu BarcelonÃ¨s. PeÃ±a-LÃ³pez, I. (2017). Voz o propaganda? TransformaciÃ³n democrÃ¡tica y tecnopolÃ­tica. Seminar for Civic tech? UtopÃ­as para el cambio, 3 July 2017. Barcelona: Escuela CÃ­vica. PeÃ±a-LÃ³pez, I. (2017). Veu o propaganda? TransformaciÃ³ democrÃ tica a les institucions tecnopolÃ­tiques. Cicle “La cultura del vot”: Quin futur per al reformisme democrÃ tic? AnÃ lisi de les experiÃ¨ncies conegudes a lâ€™Estat espanyol. 12 de juny de 2017. Barcelona: Ateneu BarcelonÃ¨s.